Heat oven to 350°F. Melt butter in 3-quart saucepan over low heat. Cook garlic in butter about 1 minute, stirring occasionally, until golden. Stir in flour. Cook, stirring constantly, until bubbly; remove from heat. Stir in milk and broth. Heat to boiling, stirring constantly. Boil and stir 1 minute. Stir in mozzarella cheese, onions, capers, tarragon and lemon pepper. Cook over low heat, stirring constantly, until cheese is melted. Spread one-fourth of the cheese sauce (about 1 1/4 cups) in ungreased rectangular baking dish, 13x9x2 inches; top with 3 uncooked noodles. Spread cottage cheese over noodles. Repeat with one-fourth of the cheese sauce and 3 noodles. 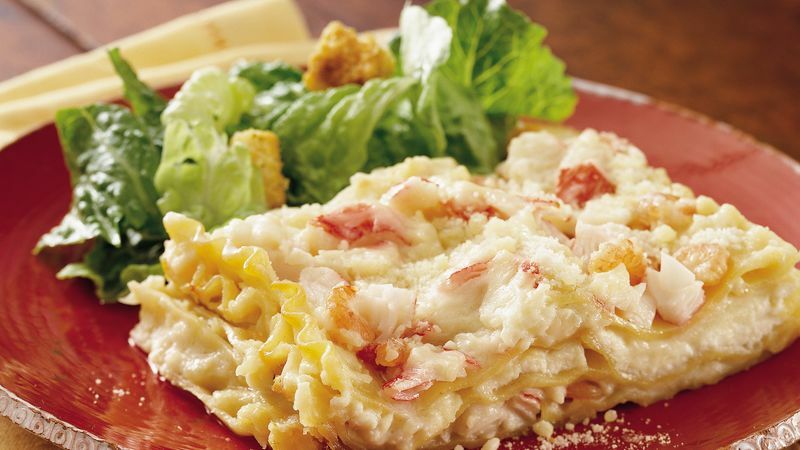 Top with crabmeat, shrimp, one-fourth of the cheese sauce, the remaining noodles and cheese sauce. Sprinkle with Parmesan cheese. Bake uncovered about 40 minutes or until noodles are tender. Let stand 15 minutes before cutting. Wrap the dish of unbaked lasagna tightly with aluminum foil and freeze up to 1 month. Bake frozen lasagna covered 40 minutes, then uncover and bake about 40 minutes longer or until hot and bubbly. You can use 6 ounces of chopped imitation crabmeat for the canned crabmeat in this recipe. It adds a nice touch of color!